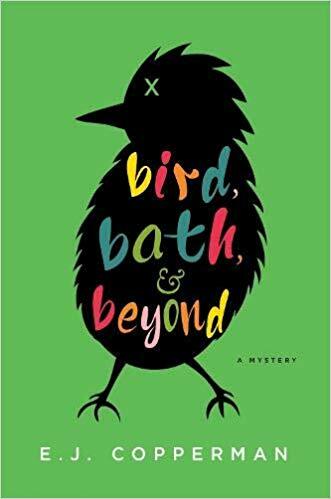 Details at the end of this post on how to enter to win a copy of Bird, Bath, and Beyond, a link to purchase it from Amazon, and an indie bookstore where a portion of the sale goes to help support KRL. Patty, Barney’s handler, is ill so Kay is on set to make sure Barney doesn’t miss a cue. When the crew takes a break and Barney’s not needed, Kay lets him rest in the star’s trailer while she runs an errand for another client. She’s only gone an hour but all that can go wrong, has gone wrong, by the time she returns. The star is dead, and Barney is a witness. Because Patty’s still sick, Barney gets to stay at Kay’s house. Already crowded with three dogs and two parents, what’s one more guest? Kay’s parents are entertainers, mostly on cruise ships now. Kay used to be part of the act until she decided to go to veterinary school. That dream was derailed by some of the classes (gross) so she became a lawyer. Working with animals is a lot more fun but at least she knows her way around a contract. For all the security and signing in at the gate, a great number of people are on the lot every day. That means the suspect pool is huge. Motive is unknown. Means—the gun was a prop, supposed to be loaded with blanks. On the home front, Kay is marginally interested in Steve who owns the coffee shop. Of course, if they actually dated and then broke up, where would she get her coffee? Best to leave it at friends. Speaking of breaking up, her mom and dad are thinking of letting her father be a solo act for a while. This is a true disturbance in the family dynamic. The mystery is a good one with possibilities everywhere. It takes a clever mind to figure out how it all happened—but will Kay figure it out in time? This is the second book in this series (Dog Dish of Doom was first). Both are enjoyable reads with great characters. Also look for three Aaron Tucker mysteries, three books in the Comedy Tonight series, nine Haunted Gatehouse mysteries, five Asperger’s mysteries (including one reviewed and given away in this issue), and two Mysterious Detective books—written as E. J. Copperman or Jeff Cohen. You won’t be sorry. To enter to win a copy of Bird, Bath, and Beyond, simply email KRL at krlcontests@gmail[dot]com by replacing the [dot] with a period, and with the subject line “beyond,” or comment on this article. A winner will be chosen November 10, 2018. U.S. residents only. If entering via email please include your mailing address (so if you win we can get the book sent right out to you), and if via comment please include your email address. You can read our privacy statement here if you like. The cover is sure eye-catching and I’ve noticed lately that I’ve been going by covers that attract me when it comes to pulling the books off my shelf, or out of my computer to read! Thanks ever so much! Another author/series not to be missed! LOVE the cover! Adding this to my reading list. Thanks for the giveaway. I love the Mysterious Detective series and I’m sure I will love this series just as much. Thanks for the giveaway! I love E.J. Copperman; I’ve read almost all of the Haunted Guesthouse series and the Mysterious Detective series. This new series sounds equally good! This sounds like a really intriguing book. A theatrical agent for animals sounds like a fascinating storyline. different twists to the story.